Sophomore Florida outside hitters Kristy Jaeckel and Colleen Ward combined for 22 kills and 15 digs Sunday and the No. 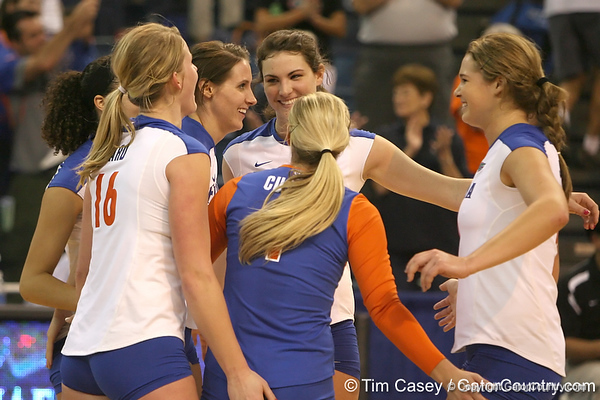 9/11 Gators hit better than .400 for the second consecutive match in a 3-0 (25-15, 25-18, 25-13) win against Auburn in the Stephen C. O’Connell Center. The Gators (20-3, 14-2 Southeastern Conference) secured their 19th consecutive 20-plus win season on Sunday. In program history, Florida has recorded 22 total 20-plus win seasons, including every year of head coach Mary Wise’s tenure. Florida hit .430 in the match, marking the second consecutive match in which the team has hit better than .400. Ward led the Gators with a match-high 12 kills on .455 hitting with nine digs and two block assists, while Jaeckel followed with 10 kills on .370 hitting to complement six digs and a team-high two service aces. Junior outside hitter Callie Rivers recorded six kills on 11 swings with no errors for a .545 hitting efficiency, while sophomore middle blocker Cassandra Anderson tallied three kills on a .600 hitting efficiency to complement a match-high four blocks. It marked the 14th time this season that Anderson has charted four or more rejections in a single match.